Now that I’m no longer on the road and I’ve settled back into my everyday life in Los Angeles, I’ve been contemplating what to do with the Beckyville Bookmobile. I love my dainty purple chariot, but let’s be real: it feels funny (often downright embarrassing) to be whipping a wrapped van around town for simple chores like mailing a letter or picking up a few items from the grocery store. Since I sold my “normal” car a few months back to pay the bills, the Bookmobile is currently my only mode of transport. I can’t sell it. Anyone who lives here will tell you L.A. isn’t known for having a great transportation system, and I need a way to navigate this maze of Spanish-named streets. I considered unwrapping the van. My ride isn’t painted, as some believe, merely enclosed in a vinyl representation of the book cover. But the wrap serves as my loud and in-your-face calling card, and I’d like to embark on another cross-country book tour in the future. Gotta maintain the brand. What’s a diva to do? 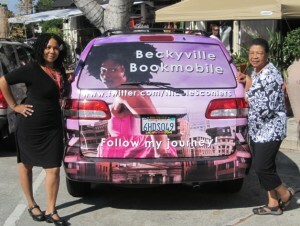 Truth be told, the Beckyville Bookmobile is more than just a display ad on wheels. As corny as it sounds, the van has become a silent but dependable friend, one that has carried me through scorching heat and snow storms, one that has seen my tears, heard my laughter and witnessed an ephemera of emotions in quiet but sturdy understanding. So yeah, I can’t give up on my wheels. Not yet. But I have been contemplating alternative uses for the Bookmobile, just to feel like I’m gaining forward momentum in my life until I hit the road again … and maybe to earn some extra cash on the side. I’m still a businesswoman, after all. Faithful Reader, I present you with three options for the Beckyville Bookmobile. Who knows? One may be coming to a street near you soon! You can’t drive three miles in La La Land without passing one of the city’s many Hollywood tour buses. I chuckle every time I spot a multi-tiered vehicle rolling down the street with an animated driver squawking out local landmarks while shades-wearing sightseers snap pictures of every point of interest. I can’t hate on tourists. I boarded similar hop-on/hop-off buses in San Francisco, Paris, Amsterdam and Sydney. It’s a great way to get around town, beef up your photo album and soak in some local color at the same time. My Culture Caravan would go another route. Literally and figuratively. First I’d welcome my customers on board with a glass of Riesling or Pinot Noir. I’d provide sparkling water for the teetotalers. Then I’d play some Nina Simone or Ella Fitzgerald as we head down the street on our adventure. We’d stop by the California African-American Museum for a few hours to check out the latest exhibits. After we got our visual art on, we’d grub on tofu fajita wraps or Nubian tacos and listen to world music at Simply Wholesome, the healthy soul food café on Slauson. Once we finished dining, we’d peruse a few black-owned bookstores in the community, such as Zahra’s Books n Things or the cultural gem Esowon. We’d end the night in Leimert Park, a mecca filled with black-owned boutiques, cafés and galleries. I’d make sure to have a spoken word artist on board, and we’d pile out of the van to listen as he or she spits poems under the street light. Cost: $150 per person; meals not included. We live in a hectic world. It’s not always easy finding time to decompress and reflect. Let the Meditation Mobile help you on your journey to inner peace. As customers step into my chrome sanctum (after removing their shoes), they’ll sit in a circle in the back of the van (the seats will be removed of course). I’ll light aromatherapy candles in the cup holders, and dab healing essential oils of lavender and ylang ylang behind the sun visors. As my clients take deep cleansing breaths, I’ll insert a Tibetan music CD, and the calming sounds of singing bowls and flutes will fill the van. There will be a yogi on board who will instruct everyone on seated yoga poses such as Butterfly, Full Pigeon and Lotus. We’ll close the session with positive affirmations and a cup of jasmine tea. The great thing about the Meditation Mobile is it doubles as a shuttle, picking customers up right from work (within a 15-mile-radius). Since we’ll be sitting in traffic for awhile, the 30-minute session will take place on a car-clogged freeway. Then they’ll feel light and centered as I drop them off at their front door. Cost: $250 per person. Nirvana ain’t cheap. Baraka went on to say that during the Black Arts Movement, he and other artists created the Black Arts Repertory Theatre/School (BART/S), an academy for black nationalists to perform their craft. He explained that BART/S employed several vans – one with visual art, another with poetry, a third with creative writing, another with plays, etc, – and took their caravan of culture to the people. I can just imagine Baraka and his fellow artists rolling through the streets of Harlem in their conveyances of conscious thought, uplifting as well as educating folks on street corners. In the spirit of Baraka’s BART/S, Words on Wheels (WoW) would be a mobile creativity center serving at-risk youth, particularly black girls aged 11 to 16. I would park at the school and open the van up as a classroom. I’d probably start small with six girls, but would bring extra chairs to extend the classroom to the playground. We’d begin with a poetry session, and the sounds of Gwendolyn Brooks, Nikki Giovanni and Langston Hughes would emanate from my CD player. We’d do positive affirmations, and I’d remind my young charges that they are beautiful, they are intelligent, they are gifted and they are loved. Next, I’d teach a creative writing workshop, where we would examine short stories written by Octavia Butler or J. California Cooper. Writing heals, gives voice to the voiceless. Lord knows, I’ve experienced this many times in my own work. WoW students would understand the significance of novels featuring powerful black women protagonists as well as women authors creating their own world where sisters rule. At the end of the six-week session, the students would produce a piece of short fiction, and would recite their work for their peers, using the van as a stage. When I’m licensed and bonded, I’ll take the girls to see plays and museums and spoken word performances. But in the meantime, I’d drive my purple mobile academy to disadvantaged schools in the community … and possibly across the nation. I know I’m being silly, but I’d love to hear your thoughts and suggestions about an alternative use for the Beckyville Bookmobile. Take a poll on the upper right sidebar!